Healthy patients did much better than those with significant medical illness(es). For example, no patient in the ASA Groups I or II died after meningioma surgery. Death was encountered only in the ASA III patients. 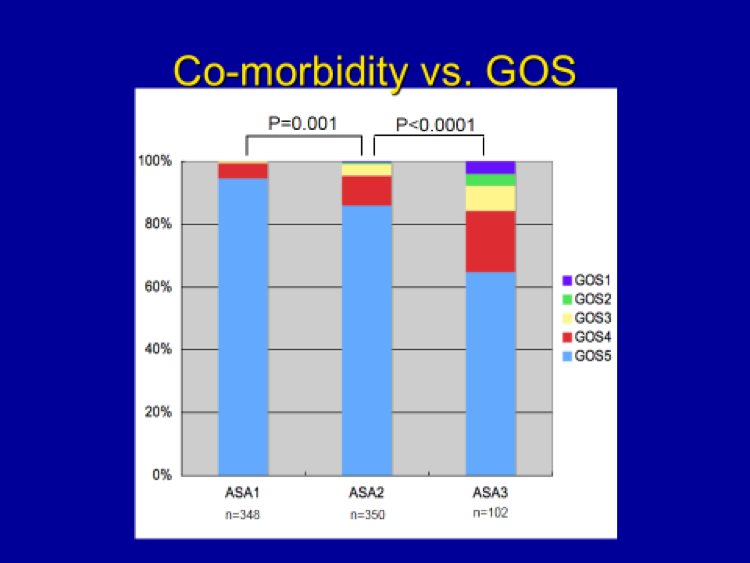 Additionally, the incidence of excellent outcome (GOS 4 & 5, close to 100% in the ASA Group I) decreased in a step-wise fashion in going from the ASA 1 to the ASA 2 group, and subsequently from the ASA 2 to the ASA 3 groups. In summary, healthy patients do very well following meningioma surgery.